A diode is a component that allows current to flow in anodecathodeelectricityforwardhigheronereversetwo direction only. 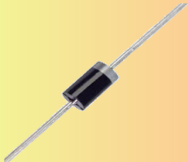 It is a component with anodecathodeelectricityforwardhigheronereversetwo leads, called the cathode and the anodecathodeelectricityforwardhigheronereversetwo . The anodecathodeelectricityforwardhigheronereversetwo is normally marked with a silver or coloured band or the symbol '-'. If the anode is connected to a anodecathodeelectricityforwardhigheronereversetwo voltage than the cathode, current will flow from anode to cathode. This is called anodecathodeelectricityforwardhigheronereversetwo bias. If the diode is put in the circuit back to front, so that the voltage at the cathode is higher than the voltage at the anode, the diode will not conduct anodecathodeelectricityforwardhigheronereversetwo . This is called anodecathodeelectricityforwardhigheronereversetwo bias.